Well hello there, Abiliteers! Uncle Wil is back to bring you up to speed on yet another passive pokémon power. In this case, we’re looking at one that grants your pokémon a Hermes-like boost to their Speed! Just be careful not to fly too close to the sun (how many of you Greek mythology buffs just yelled at me? Ha!) This is Ability of the Week: Quick Feet! Quick Feet, which I’ve briefly mentioned before as the spiritual cousin of Guts, was introduced in the fourth generation, and was originally only usable by five pokémon over three evolutionary lines. With the addition of the Dream World, though, the ranks of Quick Feet have swelled to twelve monsters and seven families. As for Quick Feet’s effect, when the pokémon with the Ability is afflicted with a status condition, their Speed stat will receive a 50% boost. The three (fully evolved) pokémon that have access to this Ability naturally are Granbull, Mightyena, and Ursaring. In fact, David recommended Quick Feet on Ursaring in papa bear’s POTW Article in May of last year. Dave, I love ya, but I have to respectfully disagree. Guts is just clearly the better Ability on Ursaring from where I’m standing. At only 55 base Speed, the 50% boost is just not going to do enough to really benefit him. And Mightyena and Granbull are in much the same boat with 45 and a somewhat viable 70 on Mightyena. But when the Dream World offers far better candidates, I’ve got to lean on the side of the snooze button. Not counting the unevolved pokémon, there are three Dream World Quick Feet users: Linoone, Scolipede, and Jolteon. Lioone is pretty much the Raticate of its generation, but you could use it as a viable status inflictor with its base Speed being boosted to 150. First of all, like Guts, the Flame Orb and Toxic Orbs will be your best friends, and Linoone has access to both Fling and Switcheroo, which we discussed in Ability of the Week: Klutz. Linoone’s arsenal also includes the dreaded Sand Attack, as well as Double Team, Swagger, Substitute, and Façade. If none of this sounds that appetizing, don’t worry, I’m just getting started. Let’s move on to Scolipede. The Megapede Pokémon has a respectable base Attack of 90, and an already impressive 112 in Speed. Add the Quick Feet bonus to that, and we’re looking at 168! With access to attacks like a STAB’d Megahorn, Double Edge, STAB’d Poison Jab, etc, plus that formidable Speed stat, Scolipede with Quick Feet is a powerhouse! …Except that it can’t be poisoned, paralysis risks full paralysis, and a burn reduces your Attack stat. I’d be worried that this Ability is totally useless and I wasted my time writing this thing. If I were an idiot and didn’t research this thing beforehand, that is. Wait. I didn’t. Yes, Jolteon! One of the original three Eeveelutions, lynchpin of Blue’s team in Pokémon Yellow Version (assuming you won in Oak’s lab and Viridian City), and my personal favorite of Eevee’s kin behind Umbreon, Jolteon sports the highest Speed of any Quick Feet user and a wicked 110 base Special Attack. Finally! Something we can play with! With Quick Feet active, Jolteon’s base Speed is just below 200, coming in at a very impressive 195. As a special attacker, Jolteon is an ideal candidate for the Flame Orb as diminishing its Attack stat won’t matter. With a base HP of only 65, the depleting health is worrysome, but that’s the risk you run with any Electric-type. Let’s arm the Lightning Pokémon, shall we? Obviously, Thunderbolt is a must-have, but what about the rest of Jolteon’s arsenal? I’d suggest Thunder Wave, but my concern is with such low defensive capabilities, every turn is precious. I’d rather concentrate on pure offense. Consider Shadow Ball, Hidden Power, and maybe even Hyper Beam as a last resort. 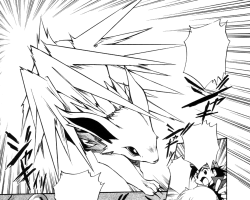 In a frustrating incident of counter-intuitiveness, most of the variation in Jolteon’s move pool are physical attacks, but that still doesn’t put a damper on that quick-strike Thunderbolt! Okay, so Quick Feet isn’t the end-all, be-all of Abilities, creating the greatest Sweepers the game has ever seen. But it is a viable method of getting slower monsters to step on the gas, and in two cases, making some of the more fleet-feeted ‘mons into speed demons. And that wraps things up for me this time! We’ll see you next week!